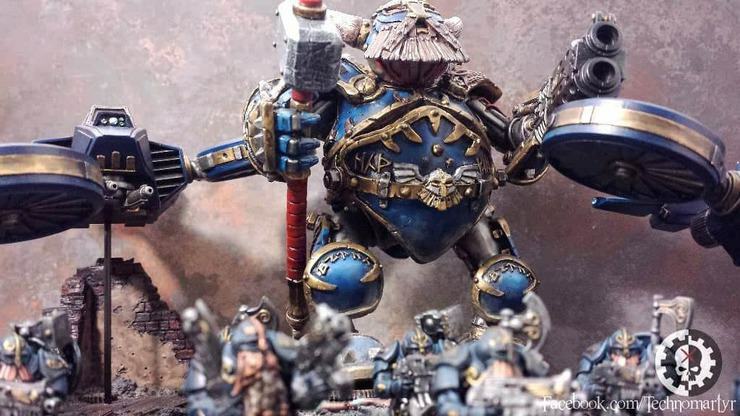 Today’s Post: NPCs Today’s the end of the titans–one each for Squats and Tau, plus my favorite version of walking death in Warhammer 40,000: the Lutomorbus. AFTER TODAY we’re going for some special units for the powers of the Warp, then one final mystery post–that’s 5 entries until the hack is over! PS: For you diehard WH04k folks out there–right now Humble Bundle has a Dark Heresy bundle! Go pick it up! Languages all (as the tongues spell); telepathy 500 ft.
Aura of Fear. Creatures within 800 feet of the Lutomorbus must succeed on a DC 18 Wisdom saving throw or become frightened for 1 minute. A creature can repeat the saving throw at the end of each of its turns, ending the effect on itself on a success. If a creature’s saving throw is successful or the effect ends for it, the creature is immune to the Lutomorbus’ aura of fear for the next 24 hours. Baleful Dirge. As a bonus action the Lutomorbus booms out an otherworldly resonance. Living creatures within a 200 feet must succeed at a DC 18 Charisma saving throw or gain the frightened condition until the end of the Lutomorbus’ next turn. Creatures that are already frightened become poisoned until the end of the Lutomorbus’ next turn. Magic Resistance. The Lutomorbus has advantage on saving throws against spells and other magical effects. Regeneration. The Lutomorbus regains 10 hit points at the start of its turn. If the Lutomorbus takes radiant damage, this trait doesn’t function at the start of the Lutomorbus’ next turn. The Lutomorbus dies only if it starts its turn with 0 hit points and doesn’t regenerate. Thousands of Eyes. The Lutomorbus has advantage on Wisdom (Perception) checks and is immune to gaze attacks. Multiattack. The Lutomorbus attacks twice. Massive Fist. Melee Weapon Attack: +17 to hit, reach 40 ft., one target. Hit: 47 (8d8+11) magical bludgeoning damage. Exploding Corpse. Ranged Weapon Attack: +17 to hit, range 1,000/2,000, one target plus multiple targets (30-foot radius). Hit: 29 (4d8+11) force damage. Creatures within a 30-foot radius of where the corpse projectile hits make a DC 18 Dexterity saving throw. On a failed save, a creature takes half damage (and no damage on a successful save). Failure by 5 or more on this saving throw afflicts a creature with the sewer plague disease. If the exploding corpse misses its target, as long as it hit within 5 points of the target’s AC the target is inside of the attack’s area. Death Whirlwind. As an action, the Lutomorbus drags its arm across the battlefield. The Lutomorbus chooses a 40 ft.-line that is 15 ft.-wide and within its reach. Creatures in the area make a DC 19 Dexterity saving throw. On a failed save, a creature takes 29 (4d8+11) magical bludgeoning damage and is knocked prone. On a successful save, a creature takes half damage and is not knocked prone. I ❤ this fella. 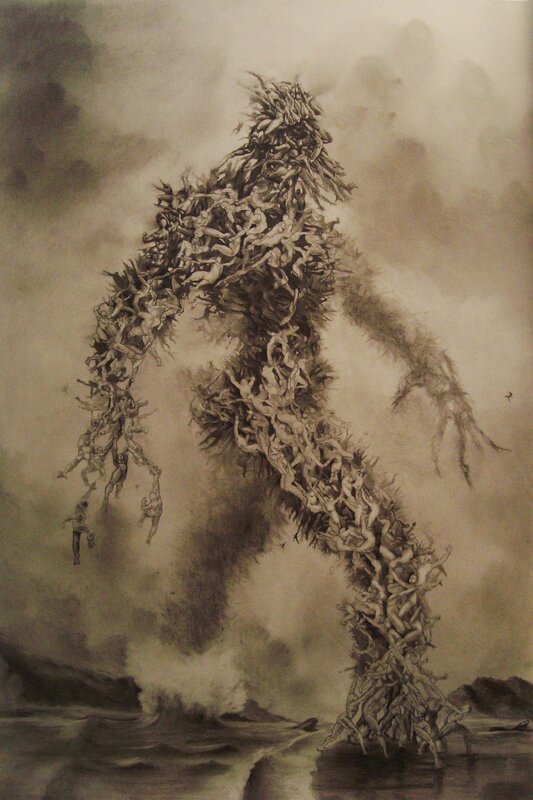 When I wanted to include it in Tome of Decay there was some tug-of-war with Games Workshop and after a bit we won out, but I ask you–if a skyscraper-sized golem made of corpses that it explosively throws at people isn’t solid for Nurgle, what is? Balanced Design. The Capillus has advantage on Strength ability checks and saving throws. Damage Threshold. The Capillus ignores any attack that deals 9 or less damage (this feature does not affect its void shields). Improved Auspex. The Capillus has advantage on Wisdom (Perception) checks. By spending a bonus action choosing a target creature that it can see, the Capillus gains advantage on attack rolls against that target until it chooses a new one. The Capillus gains a +3 bonus on ranged attack rolls. Operators. The Capillus does not grant its condition immunities to the creatures operating it (meaning they can be charmed or frightened), although they have total cover and concealment. Operators inside the Capillus gain advantage on all Intelligence, Wisdom, and Charisma saving throws. Void Shields (4). When activated with a bonus action, forcefields are emitted around the Capillus. Whenever the Capillus would take damage, the forcefield is damaged first. The void shields have no damage resistances. Each forcefield has 50 hit points and regenerates 10 hit points each round. When a forcefield is reduced to 0 hit points, a void shield breaks and requires a DC 18 Intelligence (Technology) check as a bonus action for 1d4 rounds to repair. Deactivating a void shield is a reaction. Multiattack. The Capillus attacks twice. Super Maul. Melee Weapon Attack: +10 to hit, reach 30 ft., one target. Hit: 47 (4d20+5) bludgeoning damage. Vulcan Mega Bolter. Ranged Weapon Attack: +9 to hit, range 1,000/2,500, one target. Hit: 18 (4d8+1) bludgeoning damage plus 13 (3d8) flame damage and 13 (3d8) thunder damage. I am unaware of any actual squat titan stats so I did my level best using the image above. Balanced Design. The Stormsurge has advantage on Strength ability checks and saving throws. Damage Threshold. The Stormsurge ignores any attack that deals 6 or less damage (this feature does not affect its void shields). Improved Auspex. The Stormsurge has advantage on Wisdom (Perception) checks. By spending a bonus action choosing a target creature that it can see, the Stormsurge gains advantage on attack rolls against that target until it chooses a new one. The Stormsurge gains a +3 bonus on ranged attack rolls. Magic Resistance. The Stormsurge has advantage on saving throws against spells and other magical effects. Operators. 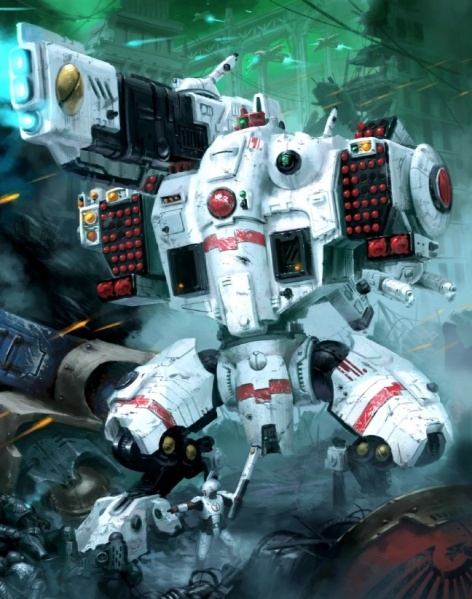 The Stormsurge does not grant its condition immunities to the creatures operating it (meaning they can be charmed or frightened), although they have total cover and concealment. Operators inside the Stormsurge gain advantage on all Intelligence, Wisdom, and Charisma saving throws. Shield Generators (4). When activated with a bonus action, shields of force appear around the Stormsurge. Whenever the Stormsurge would take damage, a forcefield is damaged first. The forcefields from shield generators have no damage resistances. At the start of its turn, each forcefield grants the Stormsurge 25 temporary hit points that last for 1 round. When a forcefield’s temporary hit points are reduced to 0, its shield generator breaks and requires a DC 17 Intelligence (Technology) check as a bonus action to repair. Multiattack. The Stormsurge attacks twice. Slam. Melee Weapon Attack: +10 to hit, reach 30 ft., one target. Hit: 47 (4d20+5) bludgeoning damage. Burst Cannon. Ranged Weapon Attack: +9 to hit, range 1,000/2,500, one target. Hit: 20 (4d8+2) bludgeoning damage plus 13 (3d8) flame damage and 13 (3d8) thunder damage. Fragmentation Projectors. Ranged Weapon Attack: range (150), multiple targets (30-foot-radius burst. Hit: 45 (8d10) piercing damage; DC 18 Dexterity saving throw reduces damage by half. Linked Flamers. Ranged Weapon Attack: range (150), multiple targets (150-foot-cone). Hit: 45 (8d10) fire damage; DC 18 Dexterity saving throw reduces damage by half. Missile. Ranged Weapon Attack: range (2,000), multiple targets (20-foot-square). Hit: 36 (8d8) bludgeoning and fire damage; DC 18 Dexterity saving throw reduces damage by half. Pulse Driver Cannon. Ranged Weapon Attack: +10 to hit, range 750/2,000, one target. Hit: 24 (4d10+2) force damage plus 22 (4d10) radiant damage. Fast Reactions. The Stormsurge has 2 reactions each round. You may choose to disbelieve me, but it has even more weapons than this (they just felt redundant enough to skip over here). Can you add things like vehicles? Right now you’ve got nothing to bridge the gap between titans and guys on foot. We need killa kans and chimeras and Leman Russes. That book also has custom weapon building rules and a lot of other fun stuff good for the hack–there’s android, mutant, and alien gaxian races, applicable tech, the playtested edition of the Scrapper class (techmarines and tech-priests ahoy), brain slugs. It’s a big book.